In 1915, when the brand new UW leader, Henry Suzzallo, saw the Seattle campus for the first time, he was in a state of shock. A graduate of Stanford and Columbia, he beheld a hodge podge of buildings and architectural styles. The setting “disturbed me greatly when I first came,” he later wrote. “The campus was naturally beautiful, but the buildings were ugly.” Many buildings were left over from a fair held six years earlier and these temporary structures were showing their age. 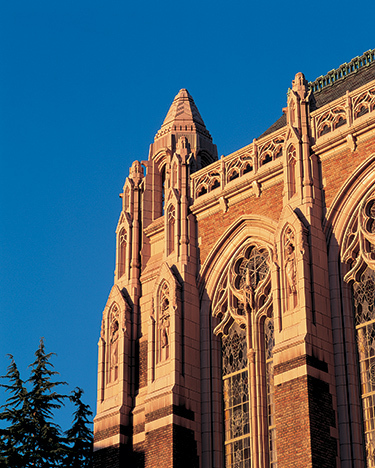 Suzzallo felt that a campus of beauty would enhance the intellectual and moral growth of his students. In his view, the extra expense of terra cotta statues, hand-crafted chandeliers and massive stained glass windows was worth every penny in a place like the Main Library. At a cost of $894,000, the library was the most expensive structure ever built on campus up to that time. That Suzzallo championed these “extravagances” irked leaders at other state colleges and many politicians, including Gov. Roland Hartley. There was bad blood between the two going back to World War I. Suzzallo was chair of the State Council of Defense, and he lobbied for new rules that gave mill workers and lumberjacks an eight-hour work day. Hartley, a timber baron, objected mightily to paying overtime. As soon as Hartley was elected in 1924, he started taking shots at the UW president. “It is not right to impoverish the many for the benefit of the few,” he declared. “We are entitled to no more educational resources than we can afford.” Tensions increased when Suzzallo talked about education as a “fourth branch” of government while Hartley insisted the executive branch was supreme. In 1926 Hartley removed two pro-Suzzallo regents when they authorized spending funds that the governor had frozen. Hartley replaced them with his own men and on Oct. 4, 1926, after a series of struggles in courts and in the Legislature, the board asked for Suzzallo’s resignation. By 1927, when the Main Library was dedicated, Suzzallo had been driven from office and its designer, Architecture Chair Carl Gould, was forced to resign. For a while there was hope of a recall initiative against Hartley, but that effort stalled and the governor was re-elected in 1928. But Hartley’s victory was brief; he was turned out of office in 1932. A year later, the former UW president was visiting Seattle when he died of a heart attack. The UW Alumni Association Board of Trustees met that night and sent a resolution to the regents proposing that the Main Library be named the “Henry Suzzallo Memorial Library.” The regents dropped the “Memorial” but kept the rest. No one can imagine a University of a Thousand Years without it.